Search Page allows you to quickly locate a page in your sitemap. You can also find a group of pages and perform bulk updates. Page Name - enter a bit of text here and concrete5 searches the page name only for a match. # Per Page - how many results to show on this page. You can check the check boxes next to pages you want to make bulk changes to, or click the checkbox in the header row to select everything in this page of results. 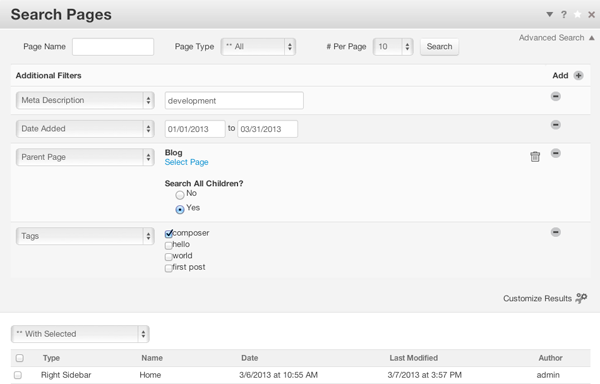 Once you have pages selected, the drop down shown above will let you make bulk changes to everything selected. The options are the same as you'd see from the editing toolbar. Advanced search allows you to further filter your inquiry. Click the Add button in the upper right to add an additional filter. You can stack up many filters. A drop down (shown) displays the filter types available to you. Each of these filter types might have it's own options that are displayed once you pick it. As you add Custom Attributes to your pages, they may be available here as well. Note: Use the Approved Version filter to make a quick workflow report showing which pages have pending changes that need to be approved.